Dislikes: Her old village, narrow-minded people, spinach (Oh dear lord, get it away!) Warm soda, cold environments. Kaaza has a very punk style and she is a tom-boy to the extreme. She is very Athletic. She loves to run and climb trees. She wears beanies, torn scarves, and raggy short cloaks. She loves her Team Skull plugs and her Fallout Nuka Cola shirt. She loves to pull pranks and crack jokes on her close friends... Even more so on her enemies. 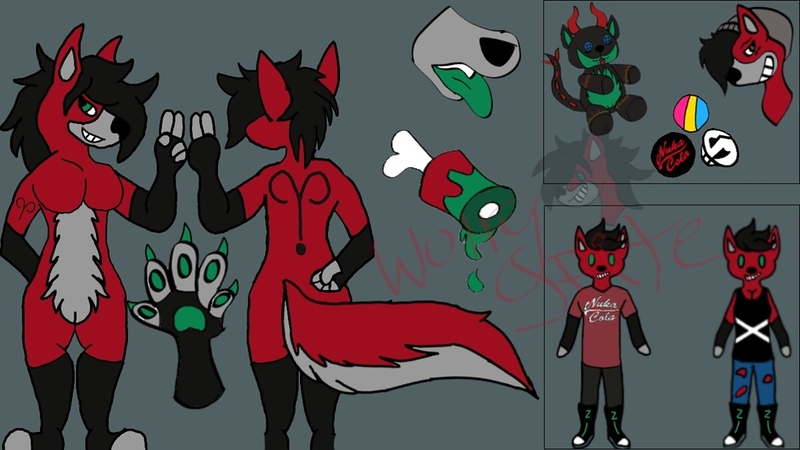 She has been seen as a rebellious thug, a failure to the Zodiac Wolf religion and way of life, and a traitor to her family and the high council of Zodiac Wolves... Kaaza sees herself as an inventor, making weapons and tech, but she's not perfect in that craft. (Usually they backfire on her) She has great ideas, but lacks the hands on craft. (That's where her best friend Gadget comes into play.) Kaaza is very artistic. She's always sketching or painting. While Kaaza may not agree with her parents view on their religion of the Zodiac wolves, she will still use her Zodiac ability in fights as a last resort. She considers herself spiritual, but not as religious as her family.